VON ORMY--A recount of the November Von Ormy Special Election was conducted today at the Bexar County Election Administrator's office. The election recount was a result of a petition filed by 27 registered voters requesting a recount of Von Ormy Proposition 1, which proposed a change to a Type C form of government. Pursuant to the State's recount procedure the recount supervisor appointed a committee of four registered voters to conduct the recount. Former Alderman Leonard Ruiz, Angie Ruiz, Former Mayor Pro Tem Sammy Martinez and Connie Martinez comprised the Recount Committee. Former Councilwoman Jacqueline Goede and former City Administrator Everett Hernandez appeared as poll watchers for the petitioners. 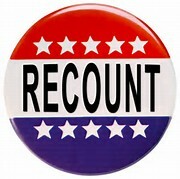 The recount resulted in the same results that were announced on election day. The petitioners were required to pay a $200.00 deposit which is now forfeited to the City to cover the expenses of the recount. The City Commission is required to canvass the results of the recount and report the official result to the Texas Secretary of State. The City of Von Ormy changed to a Type C City on November 9, 2015. Is there anyone willing to do this work other then me. Pay no attention to the name it is I David Farr. Use to be my sister phone. I will answer any questions you have for me.